Welcome to Logan Towing & Recovery. Since 1979, we have provided residents of New Jersey, New York, Pennsylvania, and Connecticut with 24-hour towing and quality emergency roadside services all from one company. Based in Jersey City, NJ, Logan Towing & Recovery is locally owned and licensed with a fully equipped fleet and a team of highly trained professionals. We have made it our mission to provide you with reliable and quality towing services. While our company continues to grow, our belief in the value of an honest, one-on-one relationship remains the same. We are fully capable of offering you a full range of automotive towing services and will gladly outperform our customers’ expectations. Our towing professionals have years of experience in the industry and it is evident in the superior work they do. We respond quickly to all calls and our live dispatch is ready to handle all situations without call back questions or delays. We provide the best in towing service and also provide assistance with jump starts, vehicle tows, and other emergency roadside services. Give us a call today and we’ll be there fast. Whether it be the toughest job or the most delicate situation, Logan Towing Inc can handle any type of heavy-duty recovery task with its extensive fleet of state-of-the-art vehicles. We make sure that behind the wheel of every truck and every piece of equipment is a highly trained operator who is as courteous as he is skillful. Our new rotator is rigged especially for the unique and demanding needs of the New Jersey/New York City area. 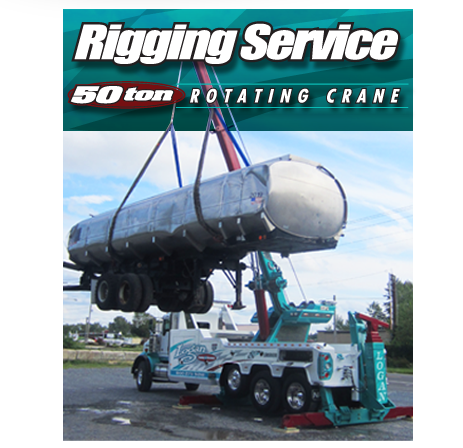 Our operators can handle a wide variety of applications - including heavy-duty industrial equipment relocating - by utilizing the truck's massive 50-ton lifting capability, and maintain the ability to rotate the load in tight areas. In the unfortunate event that a unit in your fleet is involved in an accident, a trusted company like Logan Towing Inc can handle the job and recover your equipment. We begin by assessing the best technique to minimize any additional damage and complete the job by returning your vehicle in the best condition possible. The professionals at Logan Towing Inc are available 24 hours a day, 7 days a week, even on holidays to help solve all of your roadside emergencies. Whether it be cold starts, dead batteries, frozen lines, lift gates, reefer services, lockouts, tire swaps, fuel deliveries or clean-ups, or hydraulic hoses, our trained professionals can help get your vehicle running when the road gets rough. For out-of-area emergencies, our 24-hour dispatchers have a network of service providers in all areas. Whether you need our resources or would like us to assist in coordinating the job, we are here to help.